“Spice me up” is a tactic I employed over a week in Los Angeles after making it through the winter perfectly healthy (yes, we have winter, I wore boots for a week or so) and then landing a springtime cold. Luckily it never set in too strongly, as I could still sort of smell food, which awakened my latent appetite – that remained at least a fraction of its normally-raging self. (If my appetite is gone, then I’m in trouble.) In any case, my week became a satisfying foray into soups of Southeast Asia, from Vietnam, Korea, Thailand and Malaysia. Working in the San Gabriel Valley, there’s no end to amazing Asian food (nod to xiao long bao, soup dumplings superbly done at Din Tai Fung, Wang Xing Ji, and Shanghai Dumpling House, to name a few). Yet wanting to stay somewhat on the lighter side in my compromised state, I turned to Golden Deli, a staple for pho and cha gio, fried spring rolls hailed by leading LA food writer Jonathan Gold. The pho broth is full-flavored yet delicate and not overly salty, with some certain magical quality that somehow sets it apart from the rest and makes any other pho I’ve eaten seem lackluster in comparison. Spicing up pho – or not – is a matter of personal preference. 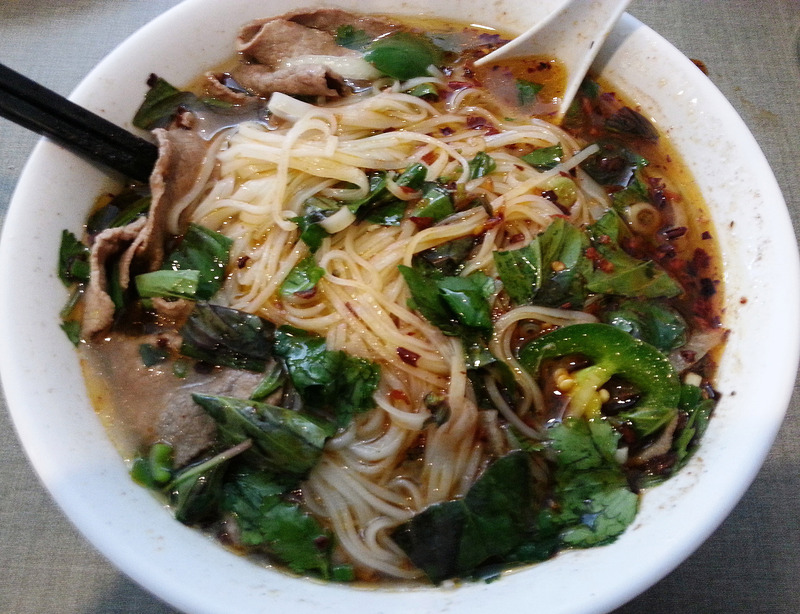 For my bowl of pho tai, rice noodle soup with rare beef, I added chili oil, enough to redden the broth to a deep earthen hue, plus lime and a few fresh jalapenos – an excellent source of vitamin C. Spice me back to health! The spice was rounded out with fresh cilantro and Thai basil, whose scent clung pleasantly to my fingertips after I tore a few leaves into pieces to add to my bowl. I also set up a small dish with a generous dollop each of sriracha and hoisin sauce, into which I dipped the meat. I finished the entire bowl, and cleared my sinuses along the way! The next day, I ventured to A Ri Rang Tofu House, also in San Gabriel. Instant gratification came right after I placed my order, as waiters served banchan, an assortment of Korean side dishes. In addition to the hot pot soup I came for, I figured banchan would provide an excellent fix of vegetables, nutrients and spice to help offset my cold. In addition to a bowl of green salad, banchan at A Ri Rang included garlicky broccoli, spicy sliced cucumbers, kimchi, some slippery-textured mung bean creation that’s incredibly difficult to pick up with chopsticks, seaweed salad, bean sprouts, fish cake, and a sweet mound of mashed potato. 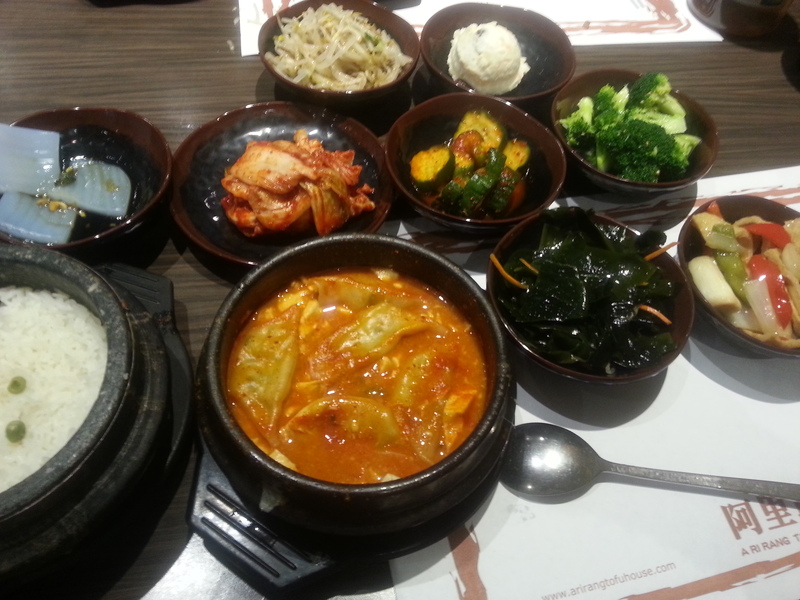 I love the variety, and this lent my hunger a bit of patience until my sizzling soup arrived. Sundubu jjigae is a tofu-based Korean stew cooked and served in a ddukbaegi, or stone bowl, not unlike dolsot bibimbop, the rice, vegetables and (usually) meat dish served in an earthenware ‘hot pot’ (dolsot). I chose the dumpling tofu soup, spicy, which was a delectable mix of silken tofu, savory pork and veggie dumplings, and spicy broth. (Extra spicy here, by the way, is reserved for the true top echelon of spice handlers. I consider myself top-tier, but not at the apex. My first visit to A Ri Rang, I brazenly ordered the extra spicy and got through it, gingerly and with some tears, and have taken it down a notch ever since.) The soup is served with an egg cracked over it tableside, and with a twin hot pot of rice, which is crispy at the bottom. Most people put soup over the rice; I like to put a bit of rice in the soup, but didn’t eat all the rice as I consumed so much banchan. Los Angeles is home to the most Koreans outside of Korea (and Persians outside of Iran), and there is no shortage of Korean barbecue joints in Koreatown. But for tofu soup, it’s hard to beat the quality and variety at A Ri Rang. On the third day, I went Thai, consuming spicy tom yum soup, which set vegetables in a hot and sour lemongrass broth. This staple can be found at a number of Thai restaurants, and I have enjoyed it at many LA Thai Town restaurants, particularly Red Corner Asia. This time, I savored it from Vegan Glory in West Hollywood. They do an excellent job with a variety of vegetables in the red broth, including cabbage, onion, carrot, tomato, mushroom, broccoli, and green snap peas. 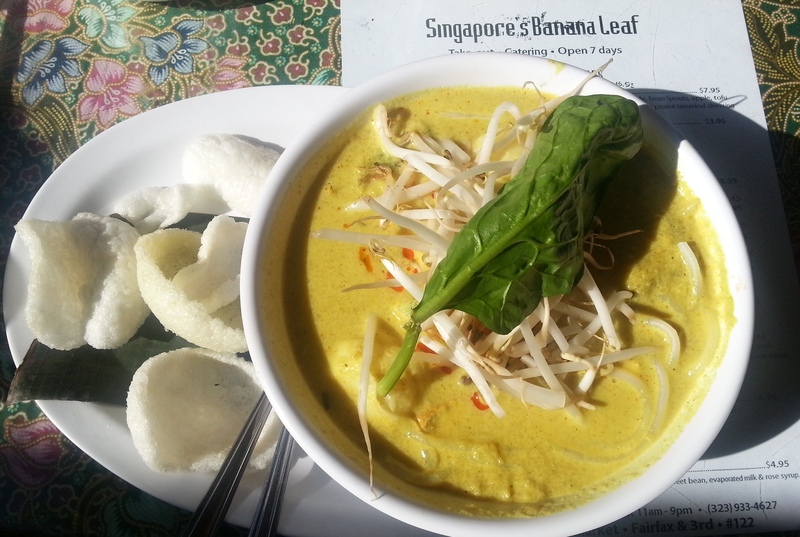 The following day, I happened upon the Singaporean-Malay-Indonesian restaurant Banana Leaf at the Grove in Los Angeles. I ordered laksa, a comforting coconut curry soup with rice noodles, bean sprouts, tofu, and homemade fish cake, garnished with a large basil leaf. It wasn’t served as spicy as I’d hoped, but I garnished it with plenty of chili paste and pickled jalapenos. If I had gone for soup for a full week, I could have rounded it out with Filipino tamarind-based sinigang, Taiwanese wonton soup from Din Tai Fung, Indian curry, or (heading northward) Japanese ramen. But my method of ‘spicing back to health’ is so effective, I think I’ve kicked this cold to the curb. I’m ready to graduate to solid foods. 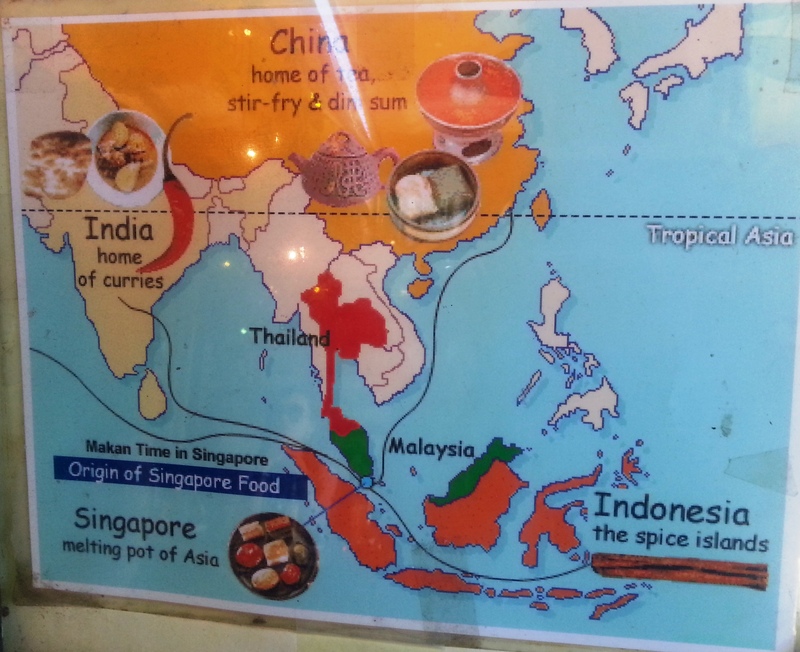 A poster at Banana Leaf – not a great image capture due to glare, but I liked the culinary depiction of Southeast Asia.